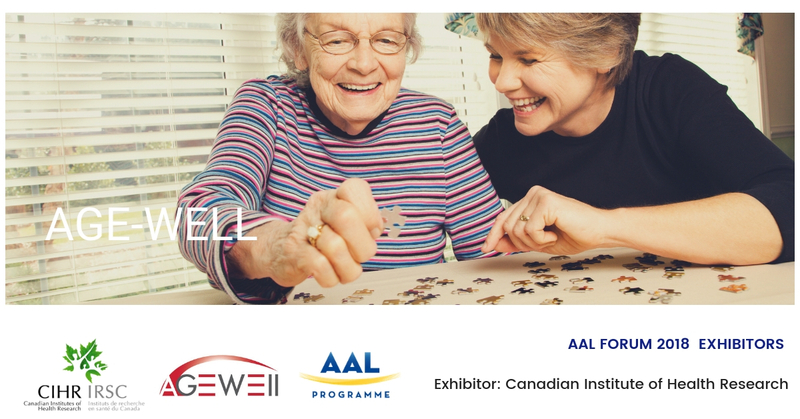 All the way from Canada, the AAL Forum will be welcoming the Canadian Institute of Health Research (CIHR) and Age-Well. The CIHR is Canada’s federal funding agency for health research and together with Age-Well their goal is to create communities and innovations that support healthy ageing through eHealth technologies. The CIHR eHealth initiative and the CIHR’s eHealth Innovations Partnership Program (eHIPP) intend to stimulate the design, testing, evaluation and spread of evidence-based eHealth solutions that are fully grounded in the needs of patients. Through ‘innovation communities’ eHIPP hopes to bring together a scientific and a clinical lead, a decision-maker to support and up-scale solutions, patient/family representation, end-user engagement and health technology industries. Aging Gracefully across Environments using Technology to Support Wellness, Engagement and Long Life NCE Inc. (AGE-WELL) is Canada’s technology and ageing network that aims to help Canadians live quality independent, healthy lives through technology. Age-Well’s network brings together more than 150 funded and affiliated researchers from 37 universities and research centres across Canada, with over 200 industry, government and non-profit partners currently. Visit the AAL Forum exhibition and find out more about the excellent work they do.